PRETORIA, March 12 (Itar-Tass) – The UN mission in the Democratic Republic of the Congo on Tuesday officially confirmed that a Russian helicopter of the YTair company with a crew of four met with an accident. There were no survivors. "The MONUSCO /United Nation Organization Stabilization Mission in the Democratic Republic of the Congo/ is now in a position to confirm the death of the 4 crew members of the helicopter. The rescue team has finally reached the site of the crash and recovered all four bodies, MONUSCO spokesperson Carlo Araujo told Itar-Tass on Tuesday. 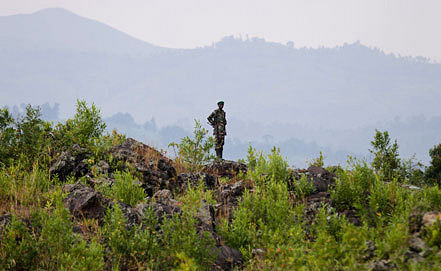 The helicopter crashed 20 kilometers off the town of Bukavu in the province of South Kivu. The Mi-8 helicopter was performing a charter flight for the UN en route Shabunda-Bukavu in adverse weather conditions in a highland area. It crashed in remote mountain jungle terrain at al altitude of 2.7 kilometers. "We cannot release the names before informing the next of kin," Araujo said.